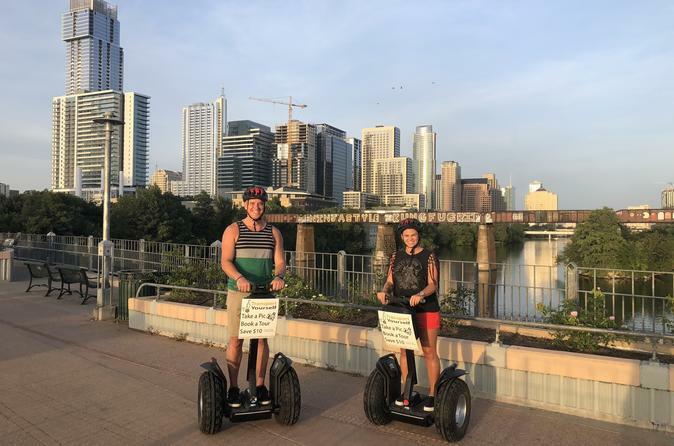 There's no better way to explore Austin's Landmarks than on a Segway. This 2.5 hour guided Segway tour will take you through Seaholm Power District, a key piece of Austin's past and allow you to go inside Austin's newly built $125M DT public library, giving you a feel for Austin's vibrant future. Many of the top tourist destinations like the Texas State Capitol grounds, Historic Congress Ave. & 6th Street are a part of the tour, as well as where the live taping of Austin City Limits takes places & Willie Nelson's famous bronze statue is honorably displayed. The tour would not be complete without a show of Austin's beloved Auditorium Shores as the last stop to view Stevie Ray Vaughan's statue. Your tour guide will be full of Texas history & City facts which will leave wanting to come back for more. Segway training for the first 30 minutes. Dress comfortably for the summer. Hat, sunglasses and sunscreen are recommended. Minimum weight requirement is 100 pounds. Maximum weight of 275 pounds. Riders must NOT be under the influence of alcohol, drugs or anything that may impair balance. Guests should be able to shift their weight from side-to-side while bending their knees and hips. Clear vision and functional hearing are imperative to tour safely. Pregnant guests in their first trimester only are permitted to participate. Guests will receive group Segway training as well as individual training. Riders under 18 must have a parent sign waiver and at least one parent or guardian be on tour with them.